FC Barcelona fell to AS Roma in their second preseason match of the US tour with a 4-2 loss. 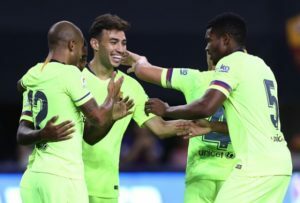 Rafinha and new signing Malcom scored in the Blaugrana’s loss. The three summer signings of Arthur, Lenglet and Malcom were in the starting lineup. First half lineup was Cillessen, Semedo, Marlon, Lenglet, Cucurella, Sergi Roberto, Arthur, Rafinha, Aleix Vidal, Munir, and Malcom. The Blaugrana took the lead following a nice interplay between Rafinha, Malcom and Munir that Rafinha score from left footed shot from the center of the box. Half an hour later, El Shaarawy scored the equalizer for Roma from a right footed shot from the center of the box courtesy of a Justin Kluivert assist. That would be the only goals in the half for both clubs. In the second half, the lineup was Cillessen, Semedo, Chumi, Lenglet, Miranda, Monchu, Riqui Puig, Rafinha, Ballou, Abel Ruiz and Malcom. Barça took the lead again five minutes after the restart following some good work by Ballou that allowed him to find an unmarked Malcom who scored a simple tap-in. This meant that both Arthur and Malcom had scored their first goals for the club since their signings. Unfortunately, for the second during this preseason, we witnessed the Blaugrana concede goals in the second half. Roma managed to score three goals in the final twelve minutes from Alessandro Florenzi, Bryan Cristante and a Diego Perotti penalty. Those goals came in a six minute span. It should be noted that Ernesto Valverde had made 10 outfield substitutions by the time Florenzi scored the equalizer for Roma. The Blaugrana will next play Milan in California on Saturday before facing Sevilla in the Spanish Supercopa on August 12 in Morocco. La Liga kicks off on August 18 when they host Alaves at the Camp Nou. AS Roma: Olsen (Mirante 46′), Florenzi (Kolarov), Manolas (Juan Jesús, 61′), Marcano (Fazio), Santon (Cristante 61′), Pellegrini (L.Pellegrini 61′), De Rossi (Pastore 61′), Strootman (Schick 61′), Kluivert (Perotti 61′), Dzelko (Gonalons 61′) & El Shaarawy. Referee: Juan Carlos Rivero (USA). Cautions: Aleix Vidal & Manolas (m.37). Previous PostFC Barcelona defeat Tottenham on penalties to kick off their preseason. Next PostBarça end US tour with a 1-0 loss to Milan.